Charlie Wellings scored after just 42 seconds as Birmingham City Women opened the new Women's Super League season with a 1-0 win over Everton Ladies. Wellings latched on to Ellen White's pass before bursting towards the box and firing past keeper Kirstie Levell. Hayley Ladd and White had chances to double the lead with close-range attempts before the break. Paige Williams then went close midway through the second half when she struck the crossbar from 25 yards. Goalkeeper Becky Flaherty was on the bench for Everton having completed a move from Liverpool Women earlier in the day. Match ends, Birmingham City Women 1, Everton Ladies 0. Second Half ends, Birmingham City Women 1, Everton Ladies 0. Attempt missed. Dominique Bruinenberg (Everton Ladies) left footed shot from the left side of the box is just a bit too high. Assisted by Siri Worm following a corner. Corner, Everton Ladies. Conceded by Aoife Mannion. Attempt missed. Charlie Wellings (Birmingham City Women) right footed shot from more than 35 yards misses to the left. Assisted by Hayley Ladd. Attempt missed. Georgia Brougham (Everton Ladies) right footed shot from outside the box is too high. Assisted by Simone Magill. Foul by Kerys Harrop (Birmingham City Women). Simone Magill (Everton Ladies) wins a free kick in the defensive half. Corner, Birmingham City Women. Conceded by Siri Worm. Attempt missed. Chloe Kelly (Everton Ladies) right footed shot from the right side of the box is close, but misses to the right. Assisted by Simone Magill. Substitution, Birmingham City Women. Emma Follis replaces Ellen White. Corner, Birmingham City Women. Conceded by Danielle Turner. Substitution, Everton Ladies. Chantelle Boye-Hlorkah replaces Claudia Walker. Delay in match Georgia Brougham (Everton Ladies) because of an injury. Foul by Paige Williams (Birmingham City Women). Georgia Brougham (Everton Ladies) wins a free kick on the right wing. Attempt saved. 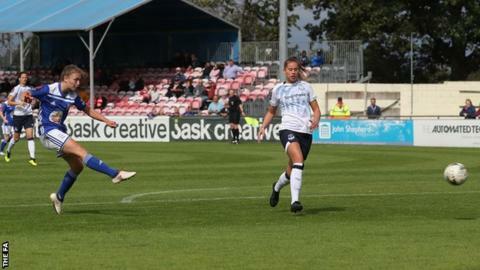 Claudia Walker (Everton Ladies) right footed shot from the right side of the box is saved in the centre of the goal. Assisted by Simone Magill. Hand ball by Aoife Mannion (Birmingham City Women). Substitution, Birmingham City Women. Chloe Arthur replaces Marisa Ewers. Marisa Ewers (Birmingham City Women) wins a free kick in the defensive half. Foul by Chloe Kelly (Everton Ladies). Attempt missed. Ellen White (Birmingham City Women) right footed shot from the centre of the box is close, but misses to the right. Assisted by Lucy Staniforth with a cross following a corner. Corner, Birmingham City Women. Conceded by Kirstie Levell. Attempt saved. Lucy Staniforth (Birmingham City Women) right footed shot from outside the box is saved in the top centre of the goal. Hand ball by Angharad James (Everton Ladies). Foul by Lucy Quinn (Birmingham City Women). Attempt missed. Hayley Ladd (Birmingham City Women) right footed shot from outside the box misses to the left. Assisted by Marisa Ewers with a headed pass. Attempt missed. Charlie Wellings (Birmingham City Women) left footed shot from a difficult angle on the left is too high. Assisted by Lucy Quinn with a cross. Substitution, Everton Ladies. Simone Magill replaces Abbey-Leigh Stringer. Substitution, Everton Ladies. Dominique Bruinenberg replaces Inessa Kaagman. Paige Williams (Birmingham City Women) hits the bar with a left footed shot from outside the box. Assisted by Aoife Mannion. Charlie Wellings (Birmingham City Women) wins a free kick in the defensive half. Foul by Claudia Walker (Everton Ladies). Foul by Aoife Mannion (Birmingham City Women). Chloe Kelly (Everton Ladies) wins a free kick in the attacking half. Hayley Ladd (Birmingham City Women) wins a free kick in the defensive half. Foul by Danielle Turner (Everton Ladies). Ellen White (Birmingham City Women) wins a free kick in the defensive half.